The inspiration for this cake probably came from To Short Term Memories’ post about Hidemi Sugino’s Charme. 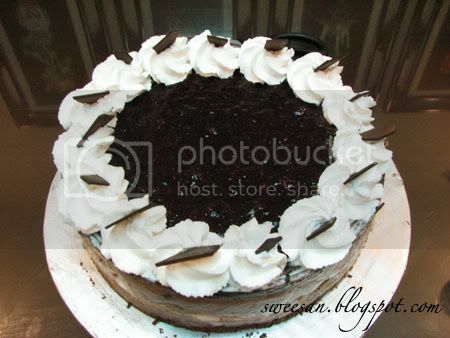 Black forest is very common and widely known but a good black forest is probably hard to find. I remember taking a shot of dark cherry kirsch in a German Restaurant in Sydney, it was great!! unlike the usual kirsch, this version has a sweeter taste to it.. I’m looking for it but don’t know what it’s called.. Ah !! maybe I should check out in Langkawi tee hee hee.. Okay.. 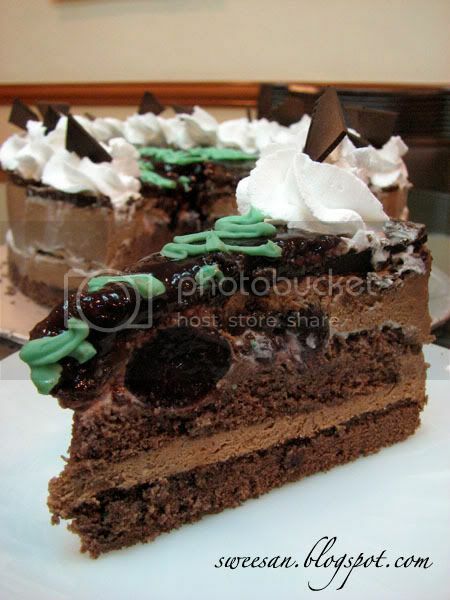 So I decided to combine chocolate cheesecake with some cherries and cream inside..
1. Cream (A) until light and smooth. 2. Bring (B) to the boil and pour into (C) slowly. Stir until well blended. Sieve it and cook over low heat while stirring constantly. Cook for 2 minutes. Remove from heat. 3. Premix (D) and place over double boiler. Stir until gelatin dissolves. Add into the mixture from step 2. Mix till well blended. 4. Place in water bath and stir until the temperature drops down to 25 C. Add it into (A) and mix until well combined. Fold in (E) and mix well. 5. Pour into ring mould with either digestive biscuit base or sponge and leave to cool for 1 hour or till set. 4. Pour in remaining chocolate cheese filling. Level top and chill. 5. For the topping, I cooked the remaining cherries and syrup with some cornstarch to thicken it. Pour over the top of cheesecake. 6. Decorate with whipped cream. 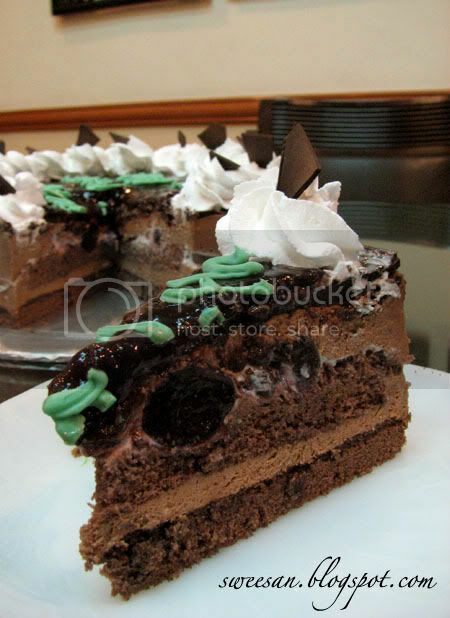 I liked the combination of the cherries and chocolate mousse-textured cheesecake. The green stuff u see on top is just some piped wordings for a birthday. and I reckon some kirsch would do the trick!! ingenious creation! looks really good..